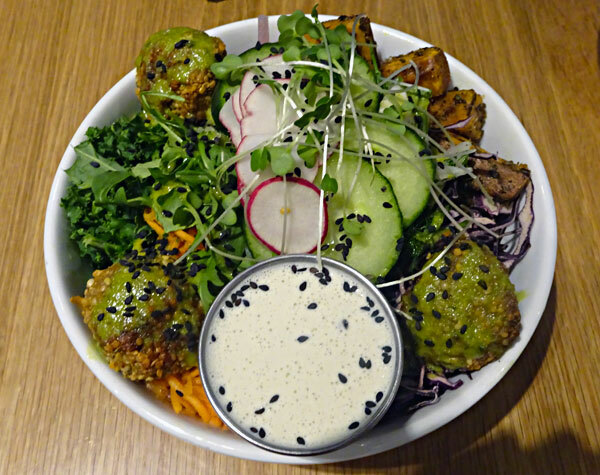 The falafel is what totally made the K&K Paleo a winner. 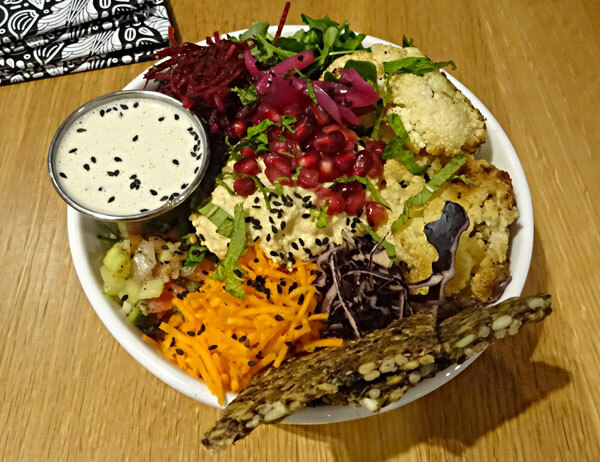 On the corner of Spadina and Richmond in Toronto, you’ll find a bright new vegan restaurant of wheatless, meatless, exceptional deliciousness. 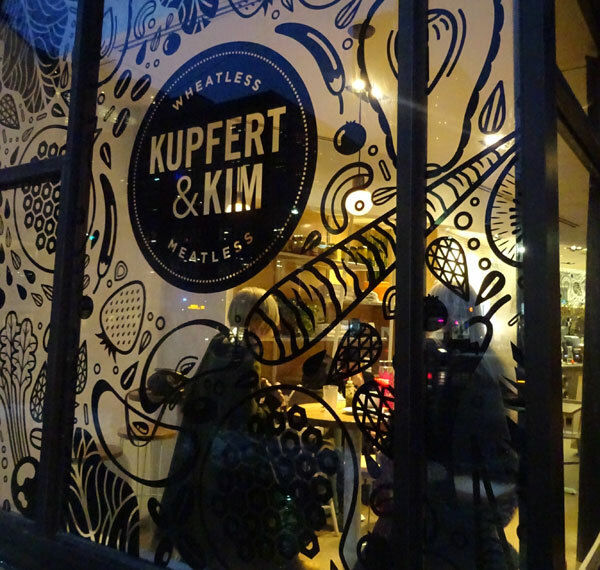 It is Kupfert & Kim‘s sixth location, offering health-conscious consumers a fast-casual service. 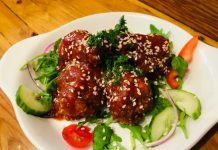 The menu is culturally neutral with some east Asian and European themes. Consider it as a basics with a twist. 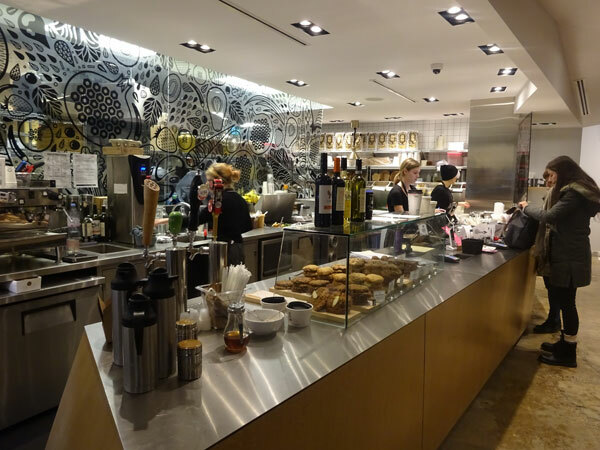 Customers place orders by a display case filled with tempting baked goods and biodynamic wine. The seating at Kupfert & Kim at Richmond and Spadina is nice in this casual dining room, which offers a mix of tables and counters. It is a comfortable spot to be if you are dining alone – you can seat yourself by a window and watch the busy pedestrian and canine traffic outside. DC: What inspired you to start? MK:a) In the early 2000’s, Daniel and I were touring in a band, and forced to eat roadside options most of the time. They were generally processed and unappealing chains. We’d chase out the healthy options, but they were never as convenient. We decided that if logistics worked out, we’d try to create a concept that was mainstream like the big brands, but would actually serve minimally-processed, ethical foods. b) Too many humans eating too much factory-farmed meat. We need more alternatives. DC: What was your main aim in this venture? MK: We want sustainable and ethical plant-based eating to be a normal, mainstream option. The planet depends on it (see below). DC: What did you think the most popular item would be? What is the most popular item? How do you anticipate what the public will like? MK: The most popular item is the Oaxaca. We assumed this would be the case, as it was designed to have the most crossover potential. It is essentially an elevated burrito bowl. It contains brown rice, black beans, pico, guacamole, but then non-gmo corn, organic kale, beets, hemp, cashew cream and organic tortilla chips. These days, black beans and guacamole still seem to be less frightening than tempeh to ‘conventional’ eaters. DC: Do you evaluate the environmental impact of ingredients? If so, how? Do you revise any of your recipes because an ingredient has too great an impact on the environment? MK: Our whole concept is inspired by the environment. According to a study by the Journal of Climatic Change, the carbon footprint of a meat-based diet is up to 2.5 higher than a plant-based one (as high as 7.19 kgCO2e/day compared to 2.89kg CO2 e/day. If we want to sustainably feed our rapidly-growing planet for years to come, plant-based eating is quickly becoming the only compelling option. It also feels good not harming sentient beings! DC: Do you have a food healing background? MK: [Co-founder Daniel Suss’s] mom is an Ayurvedic practitioner and has kept a vegetarian home for many years. Daniel and I have been friends since we were young, and his mom ultimately introduced both of us to the powers of food in regards to holistic health. I tried the expertly crafted Goji Latte made with almond milk. It is a full-bodied, dairy free and caffeine free treat just perfect for the afternoon or evening. I love coffee but need to stick to caffeine-free drinks late in the day. Many of the ingredients are organic and that is a great thing. As a rule, anything on the Environmental Working Group’s “Dirty Dozen” list is organic at Kupfert & Kim. The dishes are a balance of colour and texture. We liked that they provide the sauce on the side so you can control how much you add. I chose to add a bit of dressing at a time so that I didn’t have to toss it all together. Sampling from all around the bowl and using the sauce to bring it all together, the combination of flavours is a symphony for the taste buds. I tried the K&K Paleo, which includes roasted root vegetables (sweet potatoes in my case), sunflower falafel balls, organic arugula, organic kale, organic cucumber, purple cabbage, house-made sauerkraut, carrots, fennel, onion, dill, organic parsley, cilantro with tahini sauce and horseradish chimichurri. 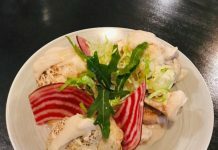 My guest tried the Cauliflower Tahini, which has a base of organic quinoa and is loaded up with house-made hummus, roasted cauliflower, carrots, pickled onion, purple cabbage, beets, mint, organic arugula, radish, black sesame seeds and za’atar salsa. It is dressed on the side with spiced lemon tahini sauce. The whole thing is speckled in a generous helping of pomegranate seeds, which gives a bit of crunch and tartness. The flatbreads are a wonderful accompaniment. Cauliflower Tahini is exceptionally colourful and flavourful. The dishes have a lot of raw veggies. It can seem like a lot of vegetable in one dish, but this really is the amount of vegetables we should be eating for good health. The dishes are satisfying, even to a carnivore. We didn’t try the sweets because the one dish each was more than filling. We look forward to stopping by again for a Banana Cocoa Muffin, Bunner’s Supersonic Cookie and a Peanut Butter Espresso Smoothie. The food is nutritious and delicious while the portions are generous. These are healthy every day options. If you crave wholesome foods to devour at your desks, this is a good place to go. Even better if you stay here and savour your meal. Final verdict – two forks up. Kupfert and Kim is located at 140 Spadina Avenue, 416-504-2206. Next articleUfficio Restaurant on Dundas St. W.
My husband goes to Kupfert & Kim in First Canadian Place. He loves their food! I would love to stop in for a Goji latte. Those dishes look so good! The food looks good, maybe I will give it a try! Wow, I can’t believe I’ve never heard about this restaurant. I need to go there right away ! Oh my gosh. Those dishes look so good. 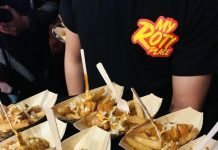 I will have to go to that resterant next visit to T.O. I used to live right near one of Kupfert and Kim locations and, in all seriousness, it’s one of the things I miss the most about my old neighbourhood! My eldest son is Vegan, I will definitely have to recommend Kupfert & Kim to him! Thanks for the post! I will have to try this restaurant when I’m in the neighbourhood! The food looks delicious! I like eating vegan food although I am not vegan. My sister was looking forward to their opening near her condo. I think I would try that cauliflower Tahiti dish!